Spring is in the air! So it’s time to set aside your winter clothes and celebrate with the latest fashion. Whether you treat yourself to a new pair of jeans for tall women or try a bold look with something completely new, there are many spring 2019 style trends to explore this season. At Alloy Apparel, we love to stay on top of the newest styles and trends each season. Here are ten trends we’re just slightly obsessed with for spring 2019. Try these gorgeous new outfits for a look that will really turn heads this spring! Whether it’s a scarf with a luxurious tassel, a chic leather jacket or a bold, artistic skirt, fringing is in! This is one of our favorite spring 2019 style trends because it’s unique yet classic at the same time. Outfits with fringe have been very popular on the runway this season. Try layering fringe with leggings or a tight pencil skirt to create contrasting textures. Bucket hats are back and girl, we are here for it! This 90s headgear is the perfect springtime accessory. Available in a wide range of materials from cloth to vinyl to leather, bucket hats protect your skin from the sun and look great while you do it. One of our favorite spring combinations is a bucket hat, vintage t-shirt and jeans for tall women. It’s the perfect, understated look for spring. When it comes to color, neon is one of the top spring 2019 style trends. Winter is behind us and it’s time to toss aside drab grays and neutral colors to really celebrate the sun. Neon colors are bold, bright and playful. Wear them as the main piece in your outfit, such as a skirt or top, or simply add some neon accessories to give your wardrobe a subtle pop. As the weather heats up and it becomes too warm to wear your favorite jeans, cycling shorts will be a great option. This trend isn’t just for the Tour De France anymore! Cycling shorts are essentially a hot weather cousin to one of our favorite wardrobe staples, the classic leggings. They’re cool, form-fitting and flattering to your curves. Next up, we’ve got animal prints. Although animal prints never really go out of style, this spring they’re roaring back into fashion. We’re especially excited about zebra print for spring 2019 style trends, as the classic black-and-white combination is a versatile choice for many different outfits. But hey, you can’t go wrong with leopard or tiger print, either. Springtime is the perfect season to get out into nature, so celebrate your inner wild child with some animal prints! Finally, there’s another fashion classic that’s back among spring 2019 style trends: polka dots! Whether big or small, black and white or multi-colored, polka dots are one of the most fun patterns you can wear. We love polka dot tops and scarves, but this pattern also works well on a skirt or dress. Have fun and explore the contrast between bright, festive polka dots and solid colors. You’ll look great for spring! This season, crochet is in! We are loving crocheted pullovers, cardigans, hats and scarves. The looser weave is perfect for spring fashion because it’s not too warm or too cold. Crocheted items also offer a cute homemade look, which can create a playful contrast with high fashion items. Try pairing a crocheted shawl with a silk blouse and black skinny jeans. We couldn’t talk about 2019 spring fashion without talking about tie-dye. This season, tie-dye is all the rage among urban fashionistas and bloggers from all walks of life. Tie-dye patterns are bold and playful. They’re the perfect choice for tops and leggings this spring, reflecting the bright colors of all the gorgeous flowers in bloom. Plus, if you’re the artsy type, homemade tie-dye is a great way to express yourself. Of course, we couldn’t list our favorite spring fashion trends without a quick word about gold and yellow. In 2019, these sunny colors are very popular. 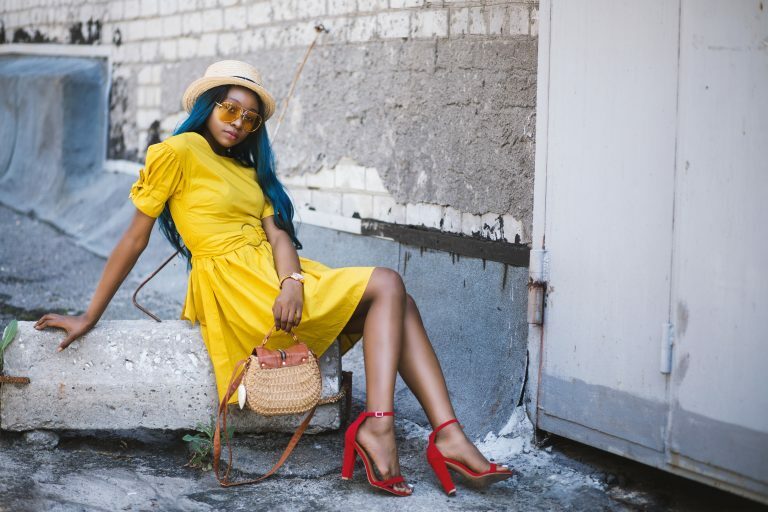 We’ve seen gorgeous yellow and gold outfits trending in the fashion world, from subtle yellow fabrics to bright, reflective metallic materials. As with any bright color, using gold and yellow can really liven up your outfit and make a truly colorful statement. What is color blocking? Color blocking is the trend of sectioning off different areas of a garment with solid “blocks” of different colors, creating lively contrast yet still unifying an outfit with unique patterns. This spring, we’re loving color-blocked tops with skirts and jeans for tall women. Color blocking provides endless opportunities to style and accessorize for all occasions. From on-trend tall basics to classic denim, Alloy Apparel is here to get you through every season – because we’ve got tall (and gorgeous!) covered.